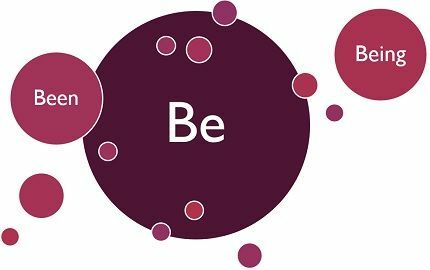 ‘Be’ is an irregular verb, which is used with prepositions to form sentences. The two forms of the verb ‘be’ are been and being that are commonly juxtaposed, during their usage. Been is used in sentences to outline some information about the subject, which is not present but from an earlier time. Rahul has been late to the class today. He is being careless. She had been going to Kerala last week, but because of being ill, she wasn’t able to. In these sentences, been and being, you might have noticed that these are used at different points. Been is used to provide information about the subject which is not the present one in both the sentences, while being in the first one, is used to reflect a sudden change in Rahul’s behaviour. On the other hand, the second one is used to denote the condition. Meaning Been is the past participle version of the verb 'be'. Being is the present participle version of the verb 'be'. Acts as Auxiliary verb to form perfect tenses. Auxiliary verb to form continuous tenses. Used with Has, have, had. Is, am, are, was, were. Prepositions We do not use been with prepositions. We use being with prepositions. Examples I have been working here for a long time. She is being rude. Shruti has been to London many times. I am being more careful, this time. They have been waiting for you, for half an hour. Being late, I didn't enjoy the party. I have been to Kerala twice. Shreya has been to the Parlor. She has been late today. We should have been left by now. The new virus killed many human beings in the city. The law came into being on 1st April. Being the eldest daughter, I took the responsibility of my siblings. Do you love being so rigid? Thanks for being with us, in our hard times. Been is a form of ‘be’, which is a past participle one. On the other hand, being is also a type of ‘be’, but present participle one. Been is used as a helping verb in sentences to form sentences in the perfect tense. As against, to form sentences in continuous tense, we use ‘being’. Been can be used as a verb only, whereas being can be used as a verb, noun and gerund. While been is used with has, have and had, being is used with is, am, are, was and were. We can use being with prepositions, but we never use been. Kiara has been my roommate for years. Joe has been so angry that he shouted badly. Who has been there in the class? Steffy doesn’t like being kept waiting. All the student like being selected for the contest. One can easily distinguish between been and being by understanding their meaning and usage. As been is the past form of ‘be’, it is used indicates something which is not or currently happening, but happened some time ago, whereas being reflects something which is going on at present.